No one wakes up in the morning with expectations of being injured. This is because we rightfully presume that the individuals around us will act with reasonable care. When individuals and entities act in a reckless or negligent manner, they put innocent people at risk of serious harm. From vehicle accidents to defective products, victims of personal injury are left to deal with life-changing medical conditions caused by the negligence of others. 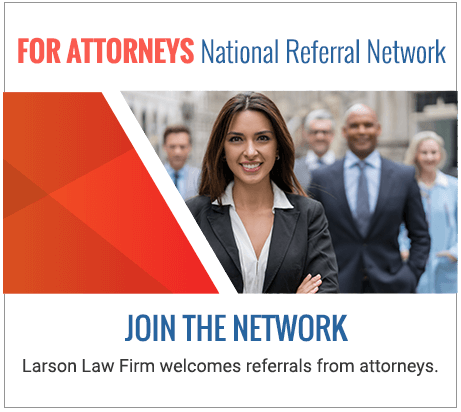 At Larson Law Firm, P.C., our lawyers have been helping victims of personal injury for almost 40 years. We know that these incidents can destroy a person emotionally, while also devastating their finances. We use our resources to carefully investigate the injury-causing accident and our skills to aggressively advocate for adequate compensation. Trust our experienced North Dakota personal injury lawyers to provide you with high-quality legal representation for your personal injury claim. Catastrophic injuries. Catastrophic injuries, such as amputations and traumatic brain injuries, usually involve difficult recoveries, multiple surgeries and long-term rehabilitation. Victims experience a decreased quality of life, possibly facing the inability to perform even the most basic tasks. Burn injuries. Burn injuries can lead to permanent, life-altering complications. Along with the disfigurement and scarring, serious burns can lead to difficulties with body temperature regulation, and may make a person more prone to infections. Back injuries. Injuries to the back can result from numerous types of incidents, including vehicle accidents, falls and medical errors. While these types of injuries often result in chronic and debilitating pain, the most severe incidents often involve damage to the spinal cord and potential paralysis. Injuries to the neck and shoulder injuries. Injuries to the neck or shoulders can cause severe, long-lasting pain. A rotator cuff injury may lead to permanent disability and require surgery to repair it. Injuries to the neck can result in spinal cord complications and, in some cases, paralysis. Soft tissue and whiplash injuries. While soft tissue and whiplash injuries can be difficult to diagnose, they cause extensive pain and suffering to the victims. These injuries should be taken seriously, and securing compensation requires assistance from a skilled North Dakota personal injury lawyer. Broken and fractured bones. Broken and fractured bones can have lasting effects. Surrounding ligaments and tissue may be injured as well, possibly leading to nerve damage and severe pain. A victim may not be able to work, leading to a significant decrease in income. Children’s injuries. When children are injured by negligence, families often feel helpless to assist them. This is particularly true when financial limitations inhibit the availability of adequate medical care and long-term treatment for injured children. Drowning. From boating and swimming pool accidents to recreational incidents, drownings occur at an alarming rate. Drowning victims may be left with brain injuries or seizures. These accidents may also result in fatalities. We also represent clients in cases involving vehicle crashes, as well as families making claims for wrongful death. The repercussions of a personal injury can be devastating, leaving victims and their families to figure out how to meet the financial demands of extensive medical treatment. Our knowledgeable North Dakota personal injury lawyers understand the challenges of a personal injury. That is why we diligently work to hold those at-fault financially accountable. The attorneys of Larson Law Firm P.C. proudly serve clients in Minot, as well as those throughout Ward, Williams, McKenzie, Pierce and Mountrail Counties. Our office is located in Minot, and you will find easily accessible parking. If you or a family member has been injured by someone else’s negligence, contact us to schedule a free consultation with a North Dakota personal injury lawyer, or call us toll free today at 701-484-HURT. What do Pain & Suffering Damages Include in ND?